This post is written on Friday, July 30, but will be posted later when the pregnancy is common knowledge. Today we had our first appointment for Annyong. He is 8 weeks today and is measuring exactly 8 weeks. Heartbeat was good and everything looked perfect! The due date is still March 11, 2011. 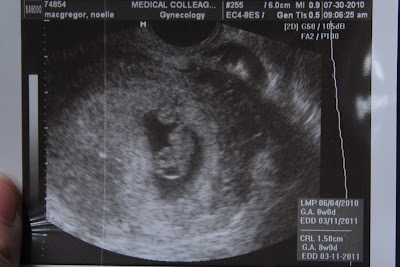 Although with all the morning sickness, we figured things would be okay, it's still a relief to see that heartbeat. Jackson doesn't realize it now, but he met his brother or sister for the first time this morning. Today we are going to start telling family and a couple of friends. It will be nice to not have to hide it from everyone! I have almost slipped with Felicia so many times, especially since she is currently pregnant. We are still going to wait a month before we tell everyone, unless the tummy makes it impossible.